A web based and copy-edited version of the introduction to the book: Silver and Grey: Fifty Years of Australian Photography 1900 - 1950, published in 1980.
originally written by Gael Newton, then the Curator of Photography at the Art Gallery of New South Wales. Presently (2006) Gael is the Senior Curator of Australian and International Photography at the National Gallery of Australia, Canberra. Note: this is basically the same as the original, the content has not been updated. The process of photography was discovered in France and England in the 1830s but was not really developed commercially until the 1850s. The first photograph made in Australia appears to have been a daguerreotype of Bridge Street, Sydney, which was described in The Australian of Saturday 15 May 1841 as "an astonishingly beautiful and minute sketch”. This comment reveals how photography was appreciated for its aesthetic power as much as its ability to make accurate records. The majority of 19th century Australian photographers were concerned with recording the character and progress of the country, or the stern faces of the settlers. It was not until the 1890s that a conscious movement, aimed at using the camera more creatively made its appearance. The new trend “pictorialism” came from England and the term reflected a desire to make evocative pictures rather than mere records. The movement followed a period in the 1880s when technological advances had initiated the era of the amateur “snapshooter”. Photography was no longer the preserve of scientifically minded gentlemen; it was the magic era of the Kodak company slogan “You Press the Button - We Do the Rest”. By the turn of the century advertisements were suggesting that photography was so simple even a child could do it (Fig.1). If it had been so simple, then or now, groups of amateurs would not have had to form camera clubs to improve the quality of their images! The first such societies were formed in the early 1890s. One of the largest was the Photographic Society of New South Wales, formed in 1894 at the suggestion of the editor of the newly launched photography magazine The Australasian Photo-Review (A.P.R.) (Fig.2). Magazines such as the A.P.R. and Harrington’s Photographic Journal, which had appeared in 1892, were usually published by photographic supply firms catering to the new amateur market. Along with technical articles and illustrations of the work of the commercial portrait studios, these magazines reported on the “art versus photography” debate which had waxed and waned since the invention of the process. The camera could render detail more easily and better than the artist and because of this it was seen by some as a threat to painting. In general, however, photography was seen as an aid to the artist rather than a potential art form. Indeed by the turn of the century the minute description of reality was not considered the chief aim of the artist - his job was to create a personal interpretation of the subject. The High Victorian taste for detailed realism had been largely replaced by a popular vogue for impressionistic effects and "art for art’s sake" attitudes. In photography various attempts were made in the 1860s and 1870s by photographers such as H. P. Robinson, Julia Margaret Cameron and P. H. Emerson to make photographs rival the accepted arts. However, it was not until 1892 that a real art movement in photography developed. This came about when a group of British photographers led by George Davison seceded from the Royal Photographic Society of Great Britain to form the Linked Ring Brotherhood, which was dedicated solely to developing photography as an art form. The pictorialists (as all exponents of art photography of the period came to be called) traced their origins back to 1890 when George Davison’s photograph "The Onion Field" won a silver medal at the annual salon of the Royal Photographic Society (Fig. 3). “The Onion Field” was impressionistic in style - an effect achieved by diffusing the sharp focus of the lens. As with the earlier art photographers’ work, “The Onion Field” was also criticised for its betrayal of the inherent realism of the camera. The Linked Ring rejected the parent society’s limitation of photography to scientific or commercial purposes. Instead, they argued that many means were justified in the creation of beautiful photographic images. Pictorial photography as a movement in Australia appears to have developed first in Adelaide in the late 1890s. John Kauffmann was credited by his contemporaries with directly introducing the style to the South Australian Photographic Society in 1897 (1) . Kauffmann was born in Adelaide and became one of the many converts to pictorial photography when he travelled to England in 1887. He abandoned his work in an architectural office and spent the next ten years studying photography in England and Europe. Whether Kauffmann exhibited at the Linked Ring salons is not known. However the style he practised on his return to Adelaide in 1897 was impressionistic (Fig. 4). According to the press reviews of his exhibitions, Kauffmann’s work was "some of the most perfect photographic work ever seen "with". . . a delicacy and gradation of the tones, giving a depth and softness singularly attractive to the lover of artistic effect" (2) . His photographs were praised as "interpretations of Nature" as if to distinguish them from more prosaic work. "You cannot minutely imitate and define everything in detail, for your picture then would lack reality and life, since it would not give the mystery in which the universe is rapt (3) ." Artists who slavishly copied nature were deficient in an understanding of the "poetry of the indefinite" (4) . Thus, if Kauffmann was the first to introduce pictorialism (or photo-impressionism as it was sometimes known) to Australia, popular taste was already conditioned to accept the soft focus and atmospheric effects in his photographs. By 1901 the annual salon of the South Australian Photographic Society was dominated by the new pictorial style. Kauffmann’s standing in the society was such that he was asked to be the judge in that year. The press review described the exhibits as the finest ever seen, with some works being mistaken for works of art owing to the absence of "all the sharp and hard lines usually associated with photography" (5) . Over the next few years pictorialism of the extreme soft focus kind became the most popular style at exhibitions run by photographic societies in all the states. Exhibitions also grew in number, size and scope. Several salons, as the exhibitions were called in those days, proudly declared that they were international but this usually meant a handful of exhibits from overseas camera clubs, and the odd print by a great name such as Edward Steichen. It was not until 1905 when the Royal Photographic Society in London sent out a loan exhibition of overseas pictorialists' work that Australian photographers could compare their work with the work of the leaders of the movement previously known only through magazine illustrations. In 1909 the Photographic Society of New South Wales invited Harold Cazneaux to hold a one-man show of his work. This was the first time a photographer's work was publicly presented in the accepted manner of one-man shows by traditional artists. It was very well received by the public and the press. Even local artists such as Sydney Ure Smith were impressed by Cazneaux's work and the progress of art photography. Ure Smith later used his position as editor of The Home magazine, founded in 1920, and Art in Australia, founded in 1916, to support the work of the best art photographers. Cazneaux had arrived in Sydney in 1904 to take up a position at Freeman's studio. He had been working as an artist-retoucher in Adelaide at Hammer's studios from 1897, and had been inspired to take up art photography by seeing the work of John Kauffmann and the Adelaide pictorialists. Cazneaux's one-man show enabled him to demonstrate "the new beauty, beyond anything I had dreamed of in terms of the camera (6) which pictorialism had revealed. It was not until Cazneaux moved to a better paid position in Sydney, and bought his first camera, a Midge Box, that he was able to express his own vision of the potential of the new art form. He began taking pictures to and from work, as well as portraits of friends and landscape studies made on excursions to the countryside. The one-man show revealed Cazneaux's hallmark - his versatility with all subjects, and contributed a new and exciting body of work to the pictorial movement in Australia. The photographs in the exhibition were done in the rather sombre, tonally impressionistic style of the day. This type of work was influenced by art nouveau and the tonal impressionism of J. M. Whistler which had been popular since the turn of and remained so until the late 1920s (fig.5). Cazneaux showed in his work how a whole range of subjects could be treated pictorially, but his images of Sydney were a revelation of the picturesque and poetic life of the city. They were taken most often at dusk or early morning on his route to work, or on misty days when the impressionistic qualities existed. Images such as "Silver and Grey - Circular Quay" (Fig. 6) which was in the exhibition, were not intended as factual records of specific places but as impressions of the atmospheric charm and bustling life of the city. Because the photographs were also unmistakably Cazneaux's vision, they affirmed that photography could be a medium of personal expression by an artist. It is well to consider at this point the impact of pictorialism on photography. The change from the 19th century style of landscape, for example, can be seen clearly by comparing Norman Deck's earliest images as in plate I , "National Park, Audley" c 1900, which is typical of the finely detailed, evenly lit scenes of late 19th century landscape photographs, with his later romantic atmospheric impressions, as in plates 3 and 5, "The In-Coming Tide" and "A Bend in the Road". Even the titles convey the change in attitude to the subject in pictorial photography. The 19th century landscape photographs described a specific place, the new pictorial images represented a response to nature. Titles were an important part of pictorialism as they were meant to suggest the real meaning of the picture. These were not literal meanings as the moralising and storytelling of Victorian painting was considered too prosaic. Instead they dealt with "the poetry of the indefinite". Titles such as "At Eventide", "Day is Done" were popular; often pictures were labelled "An Impression". They were used to suggest a sentiment about the subject. For example, James Stening's "The Edge of the Common" (plate 2), might cause the viewer to ponder that on the edges of town one might still muse upon life's meaning in the midst of a still untouche Nature before city and civilisation encroached any further. Harold Cazneaux was perhaps making a witty comment on this taste for romantic musings on nature by calling one of the pictures in his exhibition, of a man holding a billy, "Billy Meditation" (plate 15). Similarly, in portraiture one only has to recall the static, factual, evenly fit 19th century portraits in family albums, in comparison with Jack Cato's luminous study of "The Duchess of Leinster" (plate 23) to realise that pictorialism brought drama, mood and life to portraiture. In this picture the role of the beautiful woman as a divine muse is suggested by the way the duchess gazes serenely and a little expectantly upward to the light source. The added drama and atmosphere which pictorialism brought to photography was achieved by an arsenal of printing techniques which were used to suppress the detail recorded by the camera lens. Reality was not considered attractive by any of the main art styles of the day. Pictures were a heightened and improved version of life. Thus lenses were put out of sharp focus or chiffon used to diffuse the image on the final print. Unwanted details such as wrinkles or telegraph poles could be removed with re-touching tools. If the subject was not atmospheric enough, areas of the print could be darkened with pencil or lampblack and highlights added or removed with knives and whitener. Negatives could also be treated in parts with dyes to darken or lighten tone or accentuate lines. By 1917 there was a reaction against the "rut of low tone" and the imposition of English mist effects in a land of sunshine. Several groups broke away from the large societies in an effort to raise the standard of pictorial photography. Most groups were modelled on the Linked Ring in that membership was by invitation only. The Sydney Camera Circle formed in 1916 by Harold Cazneaux, James Stening, Cecil Bostock, James Paton, Malcolm Mackinnon and W. S. White was the most influential and sought to develop a distinctive Australian school of pictorial photography. Membership grew to about a dozen members and the circle enjoyed its greatest peak around 1920-22 with successes at the London Salon and the Amateur Photographer Colonial Competition. In 1921 a special exhibition of the circle members' work was held at the Kodak Salon. The momentum of the pictorial movement achieved its highest point in 1924 and 1926 when national salons were held with exhibits from other pictorial societies overseas. Substantial catalogues designed and edited by Cecil Bostock were produced for the two exhibitions. The Australian Salon did not become an annual event and leadership passed to the Victorian Salon when it was formed in 1929. In 1928 the Royal Photographic Society held an exhibition of Australian pictorial photography, which was a recognition of the success of the Australians in developing a national school. It was also the point in time when pictorialism was overtaken by the 20th century. As a movement it had in its own day been called "modern" but as societies became inclustrialised and the machine age was inaugurated pictorialists became increasingly conservative in their social and aesthetic values. By 1928 the influence of art deco could be seen in the shift to clear outlines and geometric shapes and patterns in the world of Harold Cazneaux (plates 29, 55 and 56). Although the images exploited the semi abstract designs created by light patterns they were naturalistic. Progressive pictorialists like Cazneaux were able to update their images with modern styling but could not accommodate any unnatural distortion or extreme abstraction of the subject. As Jack Cato noted in the 1950s when exchanging notes with Cazneaux for his history of photography, The Story of the Camera in Australia, pictorialism was "a revolution. A demand for the personal and individual expression of the artist - freedom from all that long dull formalism ... it was not only new, it was vital - exciting". However, "the world it expressed is passing. The Plowman no longer plods his homeward way to the thatched cottage. He drives his tractor to a streamlined bungalow" (7) . By 1928 the machine age was felt to herald a new aesthetic. In an article on "The Sydney of Tomorrow" written in 1928, Jean Curlewis commented on the "tide of industry washing further into the countryside with every month ... and the throb of reciprocating engines filling the empty sunlight like a heartbeat". The author predicted a new ideal of beauty and excitement in the forms of the machine age: "Is it possible that a year or two hence we shall lead our visitors to Walsh Bay or Darling Island and bid them mark the pattern of bold masses and intricate detail made against the sky by wheat silos? (8) "
By 1933 Max Dupain, who was then working in the commercial studio of Cecil Bostock, was making studies of the Pyrmont wheat silos which showed abstract formal structure of the subject. One of the first of these "The Silos - Morning" (Fig. 10) caused a stir at the Photographic Society of New South Wales and was only defended by Cecil Bostock against criticisms of its distortion. Industrial subjects were popular with pictorialists throughout the 1920s and 1930s as can be seen in plates 41, 46, 50 and 52 as they sought to find in the new age pictorial beauty with which they were familiar. The picturesque atmosphere of the subject was accentuated - not the machine age forms. Dupain and his generation were being influenced by the New Photography which was also known as the New Objectivity or occasionally even the New Realism. Most often it was simply called modern photography. It was developed most clearly in the Weimar Republic in Germany between 1927-33 and spread quickly to other countries. The style was influenced by developments in the visual arts in general after World War 1. In line with contemporary architecture and painting of the time the New Photography sought a pure abstract structure underlying and unifying nature and the technology of the machine age. Naturalism per se and sentimental content were rejected as were the painterly and impressionistic effects of the pictorialists. The New Photography was characterised by clean lines, clear often harsh lighting, a preference for geometric patterns and shapes and an impersonal matter-of-factness to the images. As well as purely formal experiments the New Photography encompassed a host of subjects previously considered mundane, such as industrial products, household items, and the workers who made them (Fig. 11). The Neue Sachlichkeit movement (translated as the "new matter of factness") in German painting in the late 1920s was one of the sources of the movement in photography. The art deco style had helped create a taste for geometric patterns and streamlined designs reflecting the clean lines of machinery. Developments in post impressionism and abstract art had led the way. The New Photography was also influenced by developments in experimental film making to exploit the camera lens by the use of odd angles such as bird's eye, worm's eye, close-ups, montage and assymetrical viewpoints which rendered the subject in a novel way and stressed the abstract pattern in the final image. It was a style particularly suited to the depiction of objects and industrial products and was accompanied by a massive growth in the techniques of advertising illustration. Whereas art deco was a decorative style, the New Photography was an expression of an ideology which aimed to express the character of the post-war industrial world in the 20th century. In its deepest levels the New Photography substituted for the idea of nature seen through a personal temperament (i.e. subjectivity), a theory of the image as an emotional equivalent of the essence of the subject. Where the pictorialists had used the subject as a stepping stone for the creation of idealised or more imaginative versions in their images, the New Photography analysed the objective world and looked for the quality of "the thing-in-itself". This phrase originated with Immanuel Kant but is usually associated with Edward Weston and a whole school of realism in modern photography. The New Photography reached Australia via modern advertising and publications such as Das Deutsche Licht1bild, Photographie and Modern Photography. The latter was published by the British Studio magazine and had the advantage of a text in English explaining the ideology of the new images. The local photographic magazines recommended the New Photography in these publications as a much needed stimulus to pictorialism. The latter had fallen into repetitive formulas and was out of step with the modern world. As early as 1917 the Australasian Photo-Review editors were expressing concern at the limitations of pictorialism. By 1932 editor Keast Burke was calling for support for the New Photography, if for no other reason than its brilliant technical achievements demonstrated in commercial advertising. The A.P.-R. reported on developments in London and the significant "Modern Spirit" exhibition in 1932. Their correspondent, the Rev. H. 0. Fenton, was alternately fascinated and bemused by the technical achievements and novelty of the New Photography. Like many of his pictorial colleagues, Fenton could not decide whether the new was good or bad but was bewildered by the predominance of geometric patterns and distorted or abstract views of familiar objects. He quoted F. J. Mortimer, the editor of the Amateur Photographer: "Once a man photographed a room, now he takes the keyhole and makes an enlargement of it (9) . But the A.P.-R. reported those who were more sympathetic to the threat of the new to the old world; those who believed "the modern movement may influence the future trend of photography by extending the range of our visions . . and provide us . . with much needed stimulus" (10) . The pictorialists were nevertheless bewildered by the intense embrace of the present and future by adherents of the New Photography. Max Dupain was greatly influenced by the writings of G. H. Saxon Mills in Modern Photography 1931 who proclaimed that photography "belongs to the new age, its forms are mechanistic rather than naturalistic. It is part and parcel of the terrific and thrilling panomara opening out before us today of clean concrete buildings, steel radio masts, and the wings of the air liner. But its beauty is only for those who themselves are aware of the 'zeitgest' - who belong consciously and proudly to this age, and have not their eyes forever fixed wistfully on the past" (11) . Modernism in photography was a constant feature of salons during the 1930s. Sydney Ure Smith supported both the commercial and expressive aspects of the new in the pages of The Home and Art in Australia magazines of which he was editor. Ure Smith used the chic and smart advertising of the Russell Roberts studio as well as publishing a portfolio of Dupain's work in Art in Australia in 1935. The Roberts studio was typical of the rapid growth and sophistication of commercial photography studios at the time. In 1917 at the Photographic Society of New South Wales exhibition of pictorial photography only two exhibitors were professionals. By the late 1930s the new commercial studios enjoyed a prestige equal to that of the 19th century professional photographers in the portraits and views trade - before the advent of the more imaginative amateur pictorialists. Few photographers of the younger generation understood the more intellectual side of modern photography. Dupain was an isolated figure working to make the new style deeply expressive of his personal (but not sentimental) response to the world. Despite the prevalence of modern photography in illustration and at salons, the pictorialists did not extend any special recognition to Dupain or any of his contemporaries. When the massive 150th Anniversary Salon, celebrating Australia's foundation in 1788, was organised by the pictorial and professional groups, it was billed as the "Finest Exhibition of Modern Photography" ever held in Australia. They mistook their success in attracting entries from other conservative pictorialists around the world with being contemporary. The exhibition had an enormous number of technical and artistic categories, but the awards and illustrations in the catalogue barely recognised that anything had changed in photography or the world since the early 1920s. Max Dupain was alone in the protest he made in a letter to The Sydney Morning Herald at the organisers' failure to seek out the work of great modern photographers like Lásló Moholy-Nagy, Edward Steichen and Man Ray: "Great art has always been contemporary in spirit. To-day we feel the surge of aesthetic exploration along aesthetic lines, the social economic order impinging itself on art, the repudiation of the 'truth to nature criterion', and the galvanizing of art and psychology" (12) . Dupain's language would have been incomprehensible to the pictorialists. His criticisms were dismissed and his points deflected as a personal attack on the judge, Harold Cazneaux. Even Cazneaux wrote a reply warning against "exploration along abstract lines" because the ultimate destination was unknown (13) . The Contemporary Camera Groupe included artists and photographers. Cecil Bostock was one of the members and his semi abstract study "Phenomenon" (plate 60) was one of the exhibits, along with his study of the pattern of scaffolding (plate 54). Bostock also began using the big glossy prints which came into vogue with modern photography. Bostock's work reveals that his concept of art photography was not limited to the style of pictorialism. Cazneaux and most of his pictorial colleagues found it difficult to accept either abstract or distorted imagery. They remained faithful to the idea of beauty formed in a pre-industrial society and notions of the romantic and picturesque formed a century earlier. Art was seen as a refuge rather than an adventure in contemporary life. Pictorialism as a style was increasingly displaced from the late 1920s until the advent of World War II. During the decade before World War II modern photography was established. It was most often seen as a clever stylisation for illustration work. Few photographers developed a personal body of work or understood the ideology of the image as an emotional equivalent of the subject. These years were zestful and exploratory. 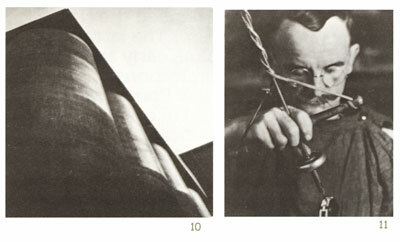 Montage was a popular technique and exercises in the techniques of Man Ray were common. Surrealism was a vogue for some time and photographers expressed literary themes. Max Dupain's "Impassioned Clay" (plate 68) was one of the few really successful images of the period using montage. The girl's torso's relationship to the spiral form of the shell was well suggested by the technique of superimposed negatives. The war carried away the mood of free experimentation of the 1930s. Efforts at surrealism, fancy techniques and the uncritical acceptance of modern products disappeared. The still photographers were greatly influenced by the documentary movement in film. This movement had a strong and imperative sense of a mission to assist in the public understanding of the relationship of all levels of society. The theorists were critical of the escapism of Hollywood glamour films. John Grierson is credited as the inventor of the term and his writings as presented by Forsyth Hardy in 1946 were influential on Sydney photographers in the post-war years. Damien Parer was a disciple of the documentary approach in film and introduced many of his contemporaries, including Max Dupain, to the ideas of the movement. The documentary movement was defined by Grierson as the "creative treatment of actuality". It was not meant to be limited to political propaganda or even obviously social subject matter. The concept allowed for spiritual and aesthetic dimensions. It was a kind of functionalist aesthetic. Grierson suggested that a job well done, with no superfluous decoration, and one which penetrated the subject to show new understanding of it was the ideal approach. "The documentary ideal, after all, demands no more than that the affairs of our time shall be brought to the screen in any fashion which strikes the imagination and makes observation a little richer than it was. At one level the vision may be journalistic, at another it may rise to poetry and drama. At another level its aesthetic quality may be in the mere lucidity of its exposition" (15) . What was important was the consideration of solid material or the solid consideration of any material. When Dupain published a monograph of his own work from 1935 to 1947 he described it as documentary in this spirit and asserted the feeling of many of his contemporaries that "modern photography must do more than entertain, it must incite thought and, by its clear statements of actuality, cultivate a sympathetic understanding of men and women and the life they create and live" (16). The new movement was sober and eloquent. It sought to express contact with the subject and present some of the feeling of the reality. It was the era which was to lead to the "Family of Man" exhibition mounted by Edward Steichen in 1955 which toured the world. It was the era of the growth of photo-journalism, the story essay and Life magazine. It was also an era in which commercial photography, particularly fashion illustration, flourished as never before. Fashion photographers like Cecil Beaton were almost as glamorous as the society figures they photographed. By the mid 1950s in Australia photographers committed to the documentary idea were being treated with indifference by the professional photographic establishment. In 1954, simultaneously in Melbourne and Sydney, Max Dupain and Athol Shmith formed breakaway group (17) from the Institute of Photographic Illustrators. The new groups were concerned at "the present high degree of technical competence, professional polish and the lack of any real personal attitude" in photography. The Institute of Photographic Illustrators had been formed in 1948 in the documentary spirit but had become involved with glamourisation rather than meaning. In 1949 reviewing one of their exhibitions, H. Tatlock Miller remarked on the watering down of the camera's real power to deal with reality. The 1950s were a difficult time for creative photographers concerned with working in a meaningful way personally or professionally. The pictorial salons had become moribund and the contemporary photographers had no similar exhibiting venues. The institute and other professional groups gave preference to commercial photography. Personal exhibitions were very rare. In 1955 the Sydney breakaway group organised an exhibition called "Six Photographers" at David Jones' Gallery. Their aim was to avoid the technical and pictorial clichés so evident in commissioned work and to make unstaged, spontaneous and personal records (18). The ideal of younger photographers was to work as photojournalists for the big magazines such as Life and many left Australia - David Moore and David Potts included - and spent the decade overseas. It was nevertheless a period when the zestful and inventive fashion photography and dramatic social portraiture of Athol Shmith flourished. Wolfgang Sievers' image of 1960 heralds the cool austerity, elegance and graphic effect which was to characterise the 1960s. Photography from the 1960s would become more introspective and rather grimly energetic, expressing perhaps disillusionment with the progress of the century. See Gael Newton. John Kauffmann - Art Photographer , The Australasian Antique Collector, 1980 ed Ition, I.P.C. Business Press, Sydney. Australia,, Star. 8 October, 1897, p. 2, and The South Australian Register, 11 February, 1898. The Adelaide Observer, 14 April, 1900, p. 15. The South Australian Register, 28 November. 1898, p.4. The South Australian Register, 19 October, 1901. Quoted in Jack Cato's The Story of the Camera in Australia, Georgian House, Melbourne. 1953.
Letters between Harold Cazneaux and Jack Cato, 1 December. 1951, and 27 February. 1952, Art Gallery of New South Wales library. Jean Curlewis. Australia Beautiful, Easter Pictorial, Sydney Number, published by The Home, 1928, p. 14. F. J. Mortimer, Photograms ofthe Year 1932, quoted in A.P.-R., March 15, 1933, pp. 124-25. Charles Borup, London review quoted in Keast Burke editorial A.P.-R., May 1932. p. 174. 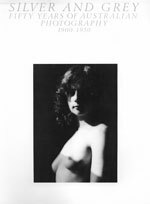 G. H. Saxon Mills, Modern Photography, its Development, Scope and Possibilities , Modern Photography, special autumn number of The Studio, London. 1931, p. 8. Sydney Morning Herald. March 28, 1938. Contemporary Camera Groupe exhibition catalogue, Art Gallery of New South Wales library. Forsyth Hardy (editor). Grierson on Documentary, Collins. London, 1946. p. 31. Max Dupain - Photographs, Ure Smith. 1948, p. 12. Letter from Max Dupain to Helmut Newton, 14 August. 1954. Norman Iken, Helmut Newton, Dacre Stubbs, Athol Shmith, Wolfgang Sievers were approached to be the Melbourne group and were meant to join in the exhibition in Sydney at David Jones' Gallery. Six Photographers. David Jones' Art Gallery exhibition catalogue, Art Gallery of New South Wales library. The six were Gordon Andrews, Max Dupain. Kerry Dunclas, Hal Missingham. David Potts and Axel Poignant. John Taylor, Pictorial Photography in Britain 1900-1920. Arts Council of Great Britain. London, 1978. David Mellor (editor), Germany - The New Photography 1927-33, Arts Council of Great Britain, London, 1978.